Killer Characters: I Was First! My author, Julie, had been writing short stories and didn't actually believe she had what it took to write a successful novel, but she saw it as a challenge and decided it was time to find out once and for all. I remember the moment I came into existence. A bright shining light and then -- boom -- there I was, alive and on the page. I was Annie. Separated from my loser husband, about to embark on a new career as a muralist, and -- no, please, no -- pregnant. I had energy, verve, and determination. And a baby on the way. I certainly didn't expect to solve a major art crime or get involved in murder. All I wanted was to create a life for myself and to put my creative talents to use to make the world a more beautiful place. Speaking of which: here's a picture of a room I did for myself just to build up my portfolio. An entire jungle room (no, not like Elvis). This wall is Victoria Falls. The other side is Mount Kilimanjaro. I'd show you a photo of that side, but this side of the room is cleaner. At the beginning of the novel, I run late for an appointment with what could be my first client. Why? Because mere moments after I took the pregnancy test, my phone rang. It was that loser husband I mentioned, Gary, calling to ask if I could run down to Cook County jail to bail him out. Oh, yeah, this was a great way to start a new career. At that point I didn't realize I was the main character in a romantic suspense. I just knew I was in trouble. No pun intended. But I survived. Don't worry, that's not ruining anything. I figure that as long as I'm writing this today, you already know I survived. It's how the story unfolded that made my life interesting. After my adventure -- Artistic License -- was complete, my author received lots of mail asking if there would be more books about me. But I'm done. I don't think I could handle that kind of harrowing excitement more than once. My author agreed and it was at that point she came up with Alex St. James. I'm sure you'll meet her one of these days. She has a few tantalizing stories of her own. All this brings me to my question. I'm not a series character. I'm a standalone. That sounds sad, doesn't it? Trust me, it's not. I'm where I need to be. Do you have any non-series characters you can recommend? I'd like to visit with them and see what my standalone sisters (and brothers) out there are up to. Annie's adventure, Artistic License, was first released in hardcover in 2004. It went into a second printing and into trade paperback and large print, but was eventually remaindered. 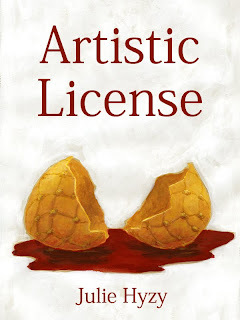 Today Artistic License is available as a Kindle book or as a Nookbook. If you've read Annie's story, please consider posting a review on either Amazon or BN.com. Hi Annie, I can't think of any stand alones of fthe stop of my head, but it's so nice to meet you and I'm heading over to Amazon to visit with you for awhile. Hi Annie, Nice to meet you. Here's Canadian stand-alone character you might like to meet. Her name is Maja Cleary & she's a plastic surgeon from Ottawa, Ontario who goes home to Minnesota when her Dad is murdered. Brenda Chapman is the author & the book is "In Winter's Grip" from Napoleon/RendezVous Crime in Toronto. It should be available on bookshelves in the US, too. She's probably looking for someone to hang out with, too. Hi Dru - it's great to meet you, too! It's been a long time since I've been out with readers, and I'm looking forward to your visit! Erika - Ooh... a plastic surgeon who solves a crime. That does sound interesting. Great title! Thank you, Erika! Hi, Annie, I'm Chessa, a standalone character, but no one has read about me. I'm sitting on my author's shelf waiting. I'm the best character she's ever written about, except Charlotte. Well, tehre are others, too. We whisper from time to time, telling our author that we want to be seen and heard, but Avery (or Daryl as she was called when WE were created) says, "Hush!" I'll tell my author about you. She loves Julie's writing! Your adventure looks rather interesting, and I've found a single copy of your book one county over in their main library branch. I'll have to take a trip to pick you up and share you with a special friend. Hi, Chessa! I absolutely love your name. Maybe, if I'm able to grab my author's ear for a moment, I'll ask her to put in a good word with Daryl next time she sees her. I would love to see your stories come alive out there. I have a feeling you and I would be good friends! NoraA - I'm so happy to hear that! I know that the books made it into lots of libraries across the nation. It's so wonderful to hear that they're still on the shelves! Thanks! Hope you and your friend enjoy! Annie it's great to meet you! You sound like a great character. Um, I dunno if you like history, but what about Jane Eyre or "Sunshine"--she's the main character in a paranormal suspense thriller? The book is called "Sunshine" by Robin McKinley. It's one of my all-time favorite novels. Shiloh - I adore Jane Eyre! Thanks for the reminder! Now I have to make it a point to meet Sunshine. Thank you!! Annie, I am very glad to hear about you. I love Julie's other books and I really liked the way you introduced yourself. I also enjoyed Maja Cleary in "In Winter's Grip" by Brenda Chapman. Every now and then a standalone romantic suspense novel is just the perfect read. Looking forward to meeting you between the pages. Wow, Annie, your story sounds like something I would really enjoy. And on that standalone thing. I don't know...characters are like ghosts. They tend to haunt authors into bringing them back. Don't get me wrong. I'm not saying that YOU would do that to your very nice (and very busy) author, Julie Hyzy, but, hey, you never know. Cheers! Hello Mary Jane - Thanks so much for the recommendation. I really enjoy hearing about great standalones, but I have to admit, your Charlotte Adams is one of my favorites, too. Cleo - so nice to meet you. I'm not sure about bugging Julie, what with the little one running around here now... (it's been a while!). But I do love Clare Cosi...thanks for bringing her to life! Hi again, Annie! Very nice to see you again. I cheered and rooted for you all the way through that hair-raising adventure you had. I'm really sorry you're a stand-alone character; I'd love to see more of you and find out what happened to you after we parted company. Say hi to you-know-who for me. Thank you, Laine! I'm so happy to know you were in my corner while... well, ... you know. And that person you referred to says hello back. Hi Annie so glad you are here. The sound of you book makes me want to read as well. I can't think of any stand alone characters right off the bat sorry :).